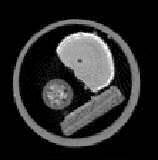 Hexagonal sampling or interleaved sampling scheme for CT scanning has been uncommonly used. The common approach for sampling a sinogram in CT is following rectangular or square pattern of data grid in Radon space (sinogram). Using the hexagonal sampling scheme, the data forms a hexagonal grid so that the number of data points required becomes half of the normal square data points. This paper presents the manner to perform hexagonal sampling and to handle the hexagonal data set, especially in focusing CT scanner design. The reconstructed CT images from the hexagonal data set were found accurate and preserved the details on the image obtained from the normal square sinogram. The implementation of hexagonal scheme in CT scanning also decreases the scanning time and the cost of system and operation. Computed Tomography (CT) scanner is considered as a powerful device for mapping internal structure of unknown object. The CT map or image is essentially a 2-D cross-sectional physical distribution representing a slice of object with a certain thickness. Therefore, CT also means to cut an object in order to see the object, layer by layer, perpendicular to the cutting direction. By this manner, CT should be a preferred method for nondestructive testing and evaluation [1, 2]. However, many critics are also addressed to CT, especially associated to the CT scanners commonly use for medical diagnostic . The cost for the system, operation and maintenance is high for Indonesia. Similar condition also occurred in industrial application. Some industry tends to use other NDT methods rather than CT. There are a number of problems associated with current CT technology. First, it is still time consuming. Time is very critical since CT for industry mostly deals with dynamic process and inherent hazardous radiation. Therefore, any attempt to shorten scanning time as well as reducing the radiation dosage is worth to pursue. Second, CT is costly in system, operation and maintenance. Therefore, it is imperative to make a simple, efficient and effective CT system. The work described in this paper attempts to solve the problem by introducing a hexagonal sampling method. The idea of hexagonal sampling has been canvassed by Wells et. al  based on the work of Rattey and Lindgren . However, Wells et. al. just described the basic theory of hexagonal sampling. The idea has been explored and the work, both simulation studies and experiments for typical first generation have been described in Suparta . This paper highlights the work on hexagonal sampling data set and the way to interpolate the data set . Then the implications to the focusing CT mode [6, 7], a special CT arrangement based on a third, rotate-rotate, CT modes  are projected. This implication is realized since typical square sampled sinogram, similar to the first, translate-rotate, CT mode, can be acquired using the focusing CT scanner design . Next section describes the experiment followed by results and discussion. The last section is concluding remarks. In the normal sampling manner, the sinogram set of projections is acquired such that the rotation step,Df or Dyf(=R Df) is equal to the translation step, Dxr = w/2. R is the radius of image circle and w is the beam-width or the width of collimator. The number of translations, in which ray-sums are collected, is equal to NS= 4R/w and the number of rotations is equal to MS = 2pR/w. Therefore, the total number of data for normal sampling is MSNS = 8pR2/w2. In contrast, the hexagonal sampling required translation step Dxr = w, but the adjacent projection should be acquired in an interleaved manner. Thus, the number of translations is NH= 2R/w and MH = MS. Hence, the total number of data required is MHNH = 4pR2/w2, half of the data required in normal square sampling. In practical scanning, the sinogram may be acquired in several ways. The most efficient sampling can be performed considering the Radon property, p(f, xr) = p(f+p, -xr). However, the manner of sinogram sampling in focusing design should consider detector pitch of w, that suggests a sampling step of w rather than w/2. Therefore, to perform hexagonal sampling central detector may be offset by w/4. Then using the preserved Radon property p(f, xs) = p(f+p, -xs) a typical hexagonal sampling [6, 11] can be obtained (Figure 1). Fig 1: Hexagonal sinogram acquired by offsetting central detector. Fig 2: Interpolation schemes for hexagonal sinogram. To justify the benefit of the hexagonal sampling in CT, a first, translate-rotate, CT apparatus [9, 10] employing normal square sampling scheme was used as a reference. Therefore, interpolation was required to form artificial square sampled data set from hexagonal data set. However there were a number of possibilities for interpolation scheme associated with direction as well as interpolation formulas (Figure 2). The proof for the benefits of this work in which the best interpolation scheme was along vertical direction or between projections has been reported in previous study . This study explored the implementation of hexagonal sampling in focusing CT design. This was accomplished by utilizing sinograms set acquired in the previous study on focusing CT held at the Department of Physics, Monash University, Victoria, Australia. The experiment was carried out using an x-ray generator with an anode target of Cu, an NaI(Tl) detector along with the electronic counting system and motorized stages system for translating and rotating the specimen. A PC (486) was used to control object movement and counting process. The diameter of object (image) circle was 16.5 mm and a collimator width was 0.3 mm x 0.3 mm. During the experiment a set of sinograms of a combined materials had been acquired for scanning interval of 360o. The set consisted of a parallel sinogram (MS = 174, NS = 111) and two focusing-like sinograms of fan-beam 45o (MS = 174, NS = 56) and 60o (MS = 176, NS = 56). The focusing sinograms formed square pattern in (f, xs) space, with a ray-path interval of Dxs = w. Hexagonal sinograms were created from folding the offset square focusing sinograms. It is expected to obtain a square data set with interval of Dxs = w/2. After acquisition for first CT sinogram and hexagonal focusing sinograms completed, the hexagonal focusing sinograms were interpolated in three ways, namely horizontal direction, vertical direction and cross direction using sinc interpolator . 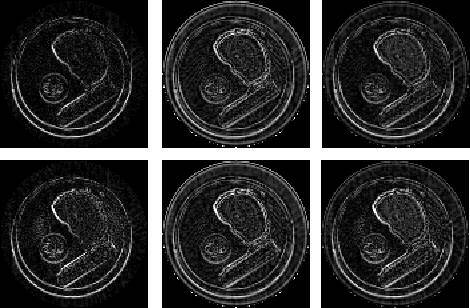 The sinograms were reconstructed using Summation Convolution Filtered Back-Projection (SCFBP) with a Ramlak filter [6, 12]. At last, the reconstructed CT images were compared to the first generation CT images. All images resulted were eligible for comparison pixel by pixel as all sinograms were acquired in similar condition and set-up. Moreover, all images had same size. Therefore, the benefits of hexagonal sampling in focusing scanner relative to the square sampled first generation CT scanner can be justified. The reconstructed CT images from focusing design are presented in Figure 3. Fig 3: CT images. From left to right: first generation CT image, focusing design for fan-angle 45o and focusing design for fan-angle 60o. Figure 4 presents hexagonal focusing CT images for different fan-angle obtained based on interpolation along vertical, horizontal and cross directions respectively. The images obtained from vertical interpolation are superior over two other interpolation schemes. These significant benefits are also highlighted by their image difference relative to the normal CT image (Figure 5). Similar results were also obtained for parallel case . Fig 4: CT images yielded from interpolated hexagonal focusing sinograms. The first row shows CT images for focusing design with a fan angle 45o. From left to right: vertical interpolation, horizontal interpolation and cross interpolation. The second row shows for focusing design with fan angle 60o. 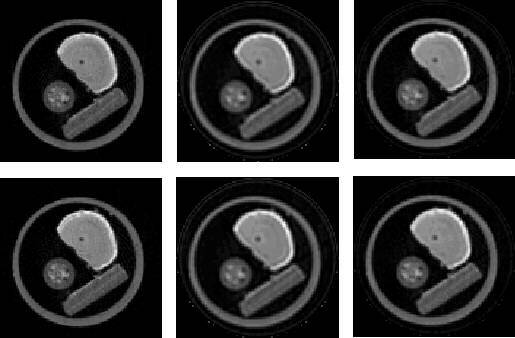 Fig 5: CT image differences of interpolated hexagonal focusing CT images relative to CT images from first generation CT image. The first row shows CT images for focusing design with a fan angle 45o. From left to right: vertical interpolation, horizontal interpolation and cross interpolation. The second row shows for focusing design with fan angle 60o. The first generation CT scanner is simple and reasonable. However, current CT scanner tends to use an array of detectors, both in a linear bank or a curved bank with a simple reason, to fasten the scanning. Employing a hexagonal sampling may reduce the cost of hardware, e.g. number of detectors, although the scanning time is not drastically improved. The quality of hexagonal images is surely comparable to the square one. The beauty of hexagonal sampling is that similar pattern of hexagonal data set over 180o can be acquired by a scanning an object over 360o. However, in this mode, the central of detector should be offset by w/4 and a projection step is now Dyf = Dxs = w following the actual detector pitch. Considering this fact, it may be possible to assemble a CT scanner apparatus for studying and finding a strategy to compensate the beam-hardening effect in CT scanner using polychromatic beams, e.g. x-rays. Based on this study, a significant saving of 50% in scanning process in the first, translate-rotate, CT mode is achieved. The best choice of interpolation method for hexagonal data set is an interpolation between adjacent projections rather than neighboring ray-sum in one projection. Further study will be carried out to find the best interpolation function. By employing a linear array of detectors, significant saving in number of detectors is also achieved since it is possible to produce a CT image with a resolution of w/2 from original pitch w, the limiting physical parameter associated with the beam width. The scanning time reduction may not significant in any third designs that employ linear or curved array of detectors. However, significant benefits may be very significant to any helical or spiral mode CT system that employs focused third CT design. The authors acknowledge the assistance of Associate Professor Peter Wells for his collaboration during finishing the thesis. The author also acknowledged the assistance from Dr. John Davis, Mr. Nino Benci, Mr. Cameron Kewish and other colleagues in Monash University, Victoria, Australia. Copley, D.C., Eberhard, J.W. and Mohr, G.A., 1994, "Computed Tomography Part I: Introduction and industrial application", JOM, January, 14-26. ASTM, 1997, "E 1441-97 Standard guide for CT imaging", Annual Book of ASTM Standards. Carlsson, C.A., 1999, "Imaging modalities in x-ray computerized tomography and selected volume tomography", Phys. Med. Biol., 44, R23-R56. Wells, P., Smith, R. and Suparta, G.B., 1997, "Sampling the sinogram in computed tomography", Materials Evaluation, 55 (7), 772-776. Rattey, P.A. and Lindgren, A.G., 1981, "Sampling the 2-D Radon transform", IEEE Trans. ASSP, ASSP-29 (5), 994-1002. Suparta, G.B., 1999, "Focussing Computed Tomography Scanner", Ph.D. Thesis, Monash University. Suparta, G.B. and Wells, P., 1999, "Focussing Computed Tomography Scanner", Physics Journal of Indonesian Physics Society, 2 (1), 30-38. Hiriyannaiah, H.P., 1997, "X-ray Computed tomography for medical imaging", IEEE Signal Processing Magazine, March, 42-59. Hounsfield, G.N., 1972, "A Method of and apparatus for examination of a body by radiation such as x-ray or gamma radiation", British Patent Number 1283915. Houndfiled, G.N., 1973, "Computerized transverse axial scanning (tomography): Part 1 Description of system", British J. Radiology, 46 , 1016-1022. Suparta, G.B., 2000, "Focusing Computed Tomography", Paper, Presented in the 15th WCNDT, Roma, Italy, 15-21 October.